Special is valid from 8th April 2019 to 30th April 2019. - Cable Car Sky Dining - Cosy up in your very own private cable car cabin and savour a delicious 4-course meal, as you take in the lights and splendor of Singapore's cityscape set against the romantic night skies with Sky Dining. *Conditions Apply: Prices are per person, capacity controlled and listed in Australian dollars twin share including port taxes. Prices may fluctuate if surcharges, fees, taxes or currency change, and may be withdrawn at any time. Prices shown here are not shown in real time. While we endeavour to keep our pricing as up-to-date as possible, the advertised prices shown here may differ from the live prices in our booking system. The prices shown are for a cash payment. Credit card fees of up to 2.5% will apply. Offer correct as at 08Apr19 and subject to live availability at time of booking. Prices are per person twin share based on best available cruise fare, inclusive of all discounts unless otherwise stated. All offers are capacity controlled and can be withdrawn or modified at any time without notice and subject to availability at time of booking. Outside and Balcony cabins may have obstructed views and Suite cabins comprises Junior Suites, Mini Suites and any other type of suite that represents the best value for each cruise. Unless otherwise stated, onboard gratuities are NOT included. Unless otherwise stated, all packages containing airfare will require full airfare and taxes within 24 hours of reservation and cancellation/amendment conditions apply. Air taxes are included in package price and are subject to change depending on departure city. Airfare and schedule is valid ex Sydney and other departure cities may require more or less accommodation due to airline schedules. All passports, vaccinations and visas are the responsibility of the travelling guest to secure prior to departure from Australia. ~Specialty restaurants may incur a surcharge. ^Bonus Credit is in US Dollars, a total per twin cabin and is non-transferrable and non-refundable. Onboard credit cannot be used at the medical centre or casino. All unused on board credit is forfeit on final night. Bonus Onboard Credit offer is subject to the discretion of Princess Cruises and may be withdrawn at any time without prior notice. To be read in conjunction with the Princess Passage Contract available at princess.com/legal/passage_contract/ which passengers will be bound by. Some cruise lines reserve the right to impose a fuel levy if the NMEX price reaches a certain level - please check with your consultant at time of booking. Cruise deposit, amendment and cancellation conditions apply. Travel agent service fees not included. Special conditions apply - please ask for full details at time of enquiry. Offer ends 30Apr19 or until sold out/withdrawn from sale. Please note only residents with an Australian address are eligible to book Australian rates in Australian dollars. This cruise package is provided by Seven Oceans Cruising, please ask your travel agent to contact us for more information. 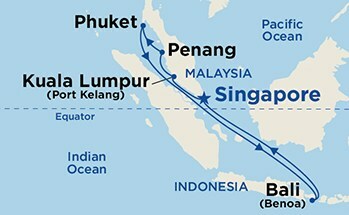 10 Night Cruise sailing from Singapore roundtrip aboard Sapphire Princess. In 1786 Francis Light persuaded the Sultan of Kedah to cede Pulau Pinang - the "Isle of Betel nut" - to the English crown. Legend has it that Light persuaded his men to clear the overgrown island of Penang by firing a cannon filled with gold coins into the jungle as an incentive. The island was renamed Prince of Wales Island, and its major town was christened Georgetown after King George III. Whether the story is true or not, Penang quickly became a major trading port for tea, spices, china and cloth. Here European, Malaysian, Hindu, Arabic and Chinese cultures met, melded and flourished. Today George Town is a cosmopolitan city that has preserved its unique heritage and its exotic blend of cultures. George Town is perhaps the best-preserved city in Southeast Asia. It boasts a European-style esplanade and a wealth of temples, mosques and Chinese clan houses. Listed as a UNESCO World Cultural Heritage Site in 2008, this virgin paradise has no shortage of cultural sights and natural scenery.